500 kg weight saving on 12 tonne distribution truck - DAF Trucks N.V.
With a vision to further increasing transport efficiency, DAF has built a prototype distribution truck with a significantly lower kerb weight. Thanks to the application of innovative and patented chassis design innovations in combination with lightweight materials and components, the Future Truck Chassis Concept (FTCC) achieves a remarkable weight saving of no less than 500 kilograms on a 12 tonne LF truck, which already offers a low kerb weight for highest payload. 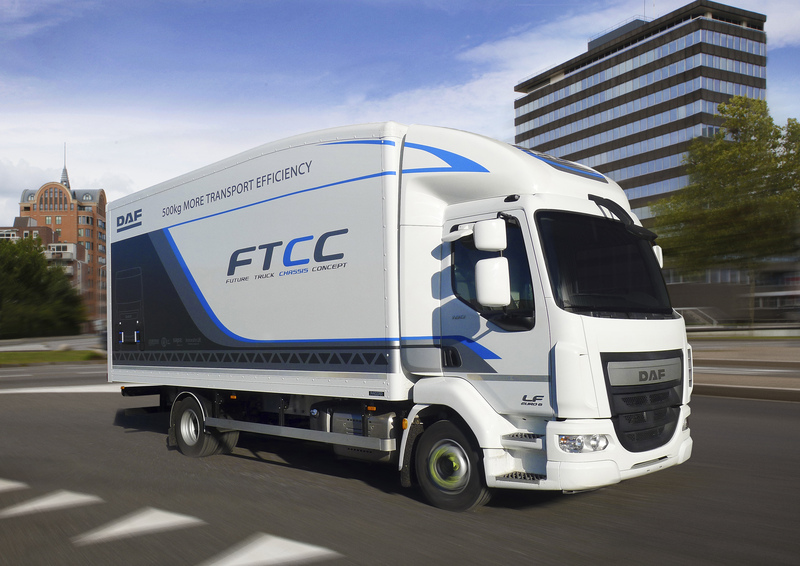 The FTCC is based on DAF’s popular LF-series and built by Leyland Trucks in close cooperation with both Sapa Profiles UK who worked extensively with DAF on the design and provided the aluminium extrusions whilst and CSA Group, who assisted with the validation of the truck by defining and conducting vehicle and rig based testing. The project was co-funded by the British Government’s Innovate UK. Aim was to realize an increased payload at a lower fuel consumption, resulting in reduced CO2 emissions. The FTCC research project features a number of new design concepts to further enhance transport efficiency. Extensive use is made of aluminium extrusions for an optimal ratio between weight and stiffness. Next to amongst others, side and cross members, parts of the wheel suspension, the floor of the body and even the Front Underrun Protection are made of aluminium. The Front Underrun Protection is mounted on a newly designed and patented front frame module. This module is smartly attached to the side members, as these don’t go to the very front of the vehicle, allowing optimal packaging. Another patented innovation is the body floor structure being integrated in the chassis frame design, by incorporating the body sub frame into the main chassis side members. In addition to the many weight saving measures, the project included a number of other advanced vehicle features such as independent front air suspension with rack and pinion steering, to investigate its benefits in terms of ride quality, steering precision and vehicle packaging improvements. The FTCC demonstrates the potential is of innovative weight saving technologies. The truck will be displayed at a variety of international events to demonstrate the technological advances it incorporates. The FTCC is first of all a study model, which won’t be on the market on short notice. However, it shows innovations which might be considered for the future if financially feasible as well.